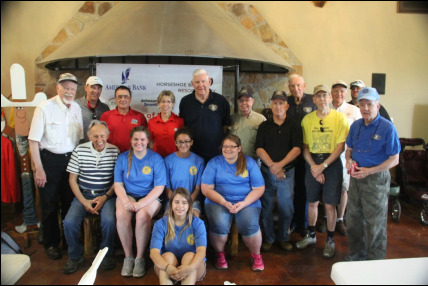 ​The Kiwanis Club of Marble Falls held its first ever Sporting Clays Challenge on June 4, 2016. 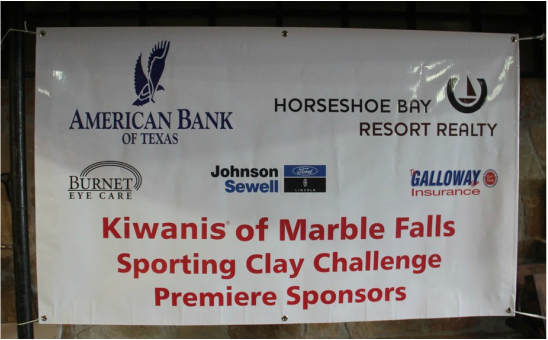 We sincerely thank our Premier Sponsors: American Bank of Texas, Horseshoe Bay Resort, Burnet Eye Care, Johnson Sewell Ford Lincoln, and Galloway Insurance. We are also grateful to our station sponsors: Salem Jewelry, Mike's Floor Covering, Ken's Heating and Air, Shane Stewart State Farm Insurance, Blue Bonnet Cafe, and Specs Family Partners. 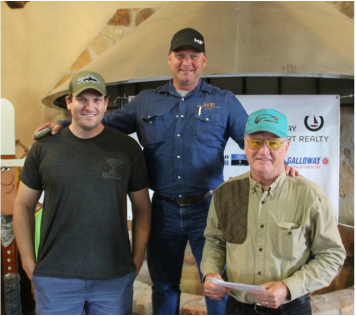 Last, but not least we thank Copperhead Creek Gun Club, both as a sponsor and for the fantastic assistance they provided to make this event possible. Shown here in the photo on the left are the winners of the Challenge. From left to right: Paul Cockerham (third place), Larry Wallace (second place), and Bob Williamson (overall point champ.) The photo on the right is a group photo of the Kiwanis and Key Club members who were volunteers for the event.